Gojju Avalakki is one of my favorite tiffin, I just love the flavours. A little tangy and sweet. Pulse in mixie the avalakki to fine powder. 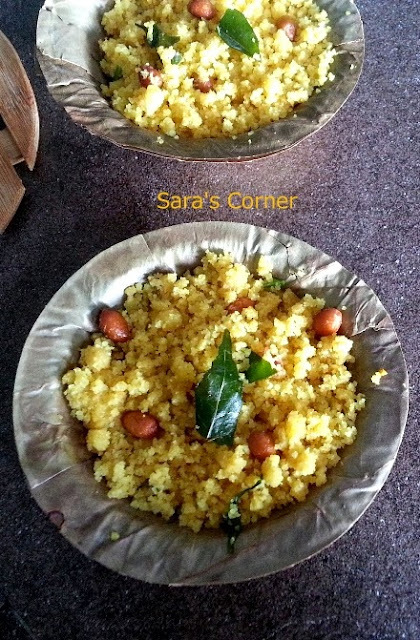 Take a wide bowl, add tamarind water, turmeric, sambar powder, jaggery and salt. Mix well. Add the powdered avalakki to this mix and leave. Heat a kadai, add oil, mustard(wait till its pops out, then add hing, curry leaves and groundnuts. Let the raw smell go of the groundnuts. Now add the avalakki slowly and mix everything. Cook for 10 mins. Check on salt. Off the stove and serve. This can be had as it is or with chutney or curds. Love to start my day with this beautiful dish, filling breakfast. I'd like to invite you to join our site www.easyrecipes.com . I really enjoy your blog and recipes and I think the over 8,000 unique daily visitors to Easy Recipes will too. By joining Easy Recipes, we will provide the Nutrition Facts for every recipe you post in which you could customize and add to your blog. Viewers need and love to know the nutritional facts. Its a free service that we offer to blogs and recipes we really love. It looks professional and your members will love it. Simply visit www.easyrecipes.com or contact me at michelle@erecipe.com. We look forward having you in our network! In my house they don't have it for breakfast ...so for evening tiff in I can try one day.Thanks for sharing .